We see lots of stuff based around this in brand research. The questions posed often range around “if Brand X were a colour, what colour would it be?”. Mind you I have also seen “If Brand X were a film star, a rock band, a car, etc.”. As I type, the direct association gets less and less. A second excellent blog, Pier. Excellent piece Pier! I knew that ‘intelligence’ test was a real irritant for you. I never realised that you were colour blind. A finished artist i used to work with was in his 30’s before realising that he was colour blind and saw colours differently from everyone else in the studio. It revealed itself one day when he and I had a slightly heated argument over a Pantone colour he referred to as gray when it was actually a green. When everyone else confirmed to him that he was wrong he was mortified. His next thought was whether his colour blindness would jeopardise his career…. Working in a job where colours are a vital part of your work etc etc. It didn’t. I know someone who says they can see colour auras around people but have the ability to switch the synesthesia on and off. 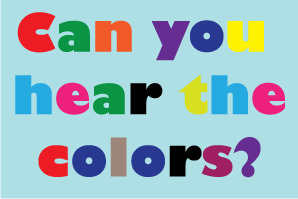 For me though, the most interesting synesthesia is the one where the ‘sufferer’ sees colours when listening to music… Just like having a built-in iTunes visualiser. Think I would like to have that one. With regard the ability of some people to see coloured “auras” around other people – I’m not sure if that fits the definition of synesthesia. The aura phenomenon appears to point to some sort of sixth sense, whereas synesthesia seems to deal with a mixup of the five traditionally recognised senses. But maybe I’m wrong! I wrote a psychology paper back in cleolge (~1976) about synesthesia, because I could really hear colors and see some sounds, (tho rarely taste words or smell music). There had been an article about synesthesia in Psychology Today, a magazine my mother subscribed to. Finally I had a term that could describe my condition . I wish I still had my paper; someone stole it from the professor’s office after he mentioned it in class. (That was back in the days of typewriters and I hadn’t made a carbon copy. )It’s interesting that these sensations aren’t as strong in me as they once were. The reading of auras is probably more a matter of religion, whereas synesthesia is a neurological phenomenon. Somehow the wiring in the brain for the processing of sensory information gets mixed up. The condition is hereditary, but it is not really a malfunction. The synesthetes I know are glad to have the condition. In learning things by heart, for instance, it helps to see that certain words are blue, or yellow. 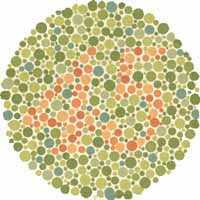 Those of us who lack the condition (or gift, or talent, or whatever it should be called) are probably to be pitied (even more so than the colour blind). Incidentallly, jonge vriend, I am very glad to find you blogging. That makes it easier for me to “keep you in the holes”, if I am allowed a Dutch expression. I hope you’ll continue to find the time to write at the level of excellence you’ve demonstrated so far. A grapheme-color story: I’ve known about sehistnysea since I was in high school, in 1972 or so. A few years ago I learned hiragana (not the language, just the syllabary). The characters just looked black and white at first. Then as I got familiar with them and their sounds, color faded in.Skeets, music looks like sometimes thin red lines in the upper left, sometimes parallel lines straight ahead, which are brown, sometimes strings of beads or cascades of shiny triangles. This is classical music I’m describing but other kinds have similar visual effects.